Written in the thirteenth century AD in Icelandic but based on much older source material, The Story of the Volsungs is a legendary Norse mythological saga. 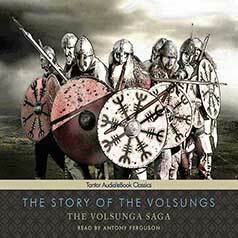 Originally written in Icelandic in the thirteenth century AD by an anonymous author, The Story of The Volsungs is a legendary saga based on Norse mythology. The epic describes the legendary history and heroic feats of several generations of mythic Viking families and derives from many sources, including preexisting Edda, or heroic poems, Norse legends, historical events, and orally transmitted folklore. The saga is imbued throughout with themes of power, jealousy, love, vengeance, and fear. Often considered a critical influence on such later works as Richard Wagner's Ring Cycle and J. R. R. Tolkien's Lord of the Rings trilogy, The Story of the Volsungs is a powerful epic that continues to resonate for modern listeners. This edition—which includes excerpts from the Poetic Eddas, one of the sources of The Story of the Volsungs—is the translation by William Morris and Eirikr Magnusson.